Join the thousands of professionals who already choose UK Planning Maps for their mapping requirements. UK Planning Maps Trade Accounts offer great value for money on your Mapping requirements, with simple monthly invoicing. Our Trade Accounts are ideal for all professionals who regularly purchase maps. Trade Accounts offer very low pricing; Site Plans start at £7.23, with monthly invoicing. We offer free preview of plans online and instant download of plans after purchase. We offer the following formats: Autocad DWG, DXF, PDF, Word Doc and Jpg. Call us on 01856 898 022 or click the link below to fill in our online form. There is no fee to preview your map. Unlike other providers, with UK Planning maps you can preview your map for free. You will be able to select the area you need based on the actual OS Mastermap® data. Orders can be checked again at checkout. Trade account holders are able to define a map of any shape and size and are not simply limited to our standard size and shape maps. This means that our trade account customers are able to purchase exactly the mapping they need. Our DXF/DWG format maps all include free 5m contour lines and for a small additional fee a digital terrain model giving the mean average height of every 5m square across Great Britton. Our maps are very competitively priced; our Trade Accounts are even more cost effective. We really value your loyalty so Trade Accounts attract a 15% discount on all orders. This discount is automatically applied to all orders you place on the website. We invoice at the end of each month with payment by Direct Debit. We can also accept BACS or Credit Card online subject to a small fee. Our payment terms are 14 days. We supply Autocad DWGs as well as DXF files. Our files are compatible with Autocad 2004 and above. If you are running an older version of Autocad please let us know when you sign up for your Trade Account and we will ensure that your files are automatically generated in a compatible format. Our formats are not Georeferenced, but do include grid lines for ease of use. For an example of our files please see our Pricing and Samples page. We also supply maps in the following formats: PDF, JPG and Word Doc. Click here to see our samples. UK Planning Maps is run by copla ltd. A specialist website and software company, founded in 2004 we have a reputation for quality products that offer real value for money. We are an official Ordnance Survey partner, and as such we are supplied with updates every 6 weeks, to ensure every map we sell is the best quality and most up to date map available. UK Planning Maps uses the best quality Ordnance Survey data, Mastermap®. Our maps include four separate layers and extensive topographic information on all features such as buildings, roads, pavements, phone boxes, landmarks, etc. Each landmark has its own Topographic Identifier (TOID) to ensure it is included in the maps we sell. 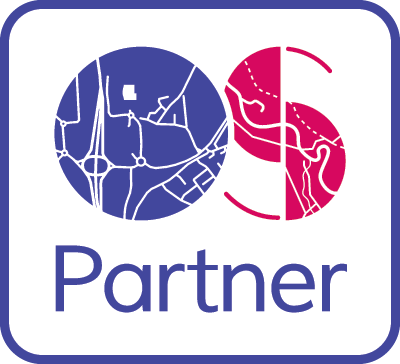 We are an official Ordnance Survey partner. All of our maps carry the correct license and copyright statements for use. We offer a simple online highlighter to enable you to quickly outline boundaries in red or blue. These boundaries are displayed on any digital or print copies of your map. All staff that need to order plans can do so with your account and it will all be added to the same monthly invoice. You can keep an eye on your total monthly expenditure on your "my account" page. If you require printed copies of your plans, we can supply 6 copies free, you only pay Postage and Packaging. All printed maps are full colour and on quality, 120gsm paper. We can accept payments by Direct Debit for ease. These are automatically calculated for your usage, there is no monthly fee and you do not pay anything if you do not use the account in a given month. We can also accept payment by BACS transfer and by Credit Card online. We include 3 months free secure online storage with all trade accounts. This means that all plans you order and your invoices can be accessed online for 3 months, along with the current balance of your account. You can log in and download plans at any time and from any location.